This 14 page layout is included with Proposal Pack. Create variations of this document of any length to suit your specific needs. Order and download for $79. This set of templates was selected for a proposal written by the operator of a juice bar company to a local gym about the opportunities and benefits to a partnership by letting the juice bar lease space within the gym. You can also create countless variations of this document to suit your specific needs using the included library of 2000+ chapters. awesome product! We do a lot of short turnaround 25-30 page task order proposals and for that alone, this is a great tool! Thanks for the great support in getting this downloaded correctly, much appreciated." You can create this document using any of the logo designed Proposal Packs. Pick any Proposal Pack that has a logo design theme you personally like best, they all will work equally well. The Proposal Pack for Any Business is the pack with no extra added logos or colors - designed to be used plain or for you to customize with your own logos and graphics. 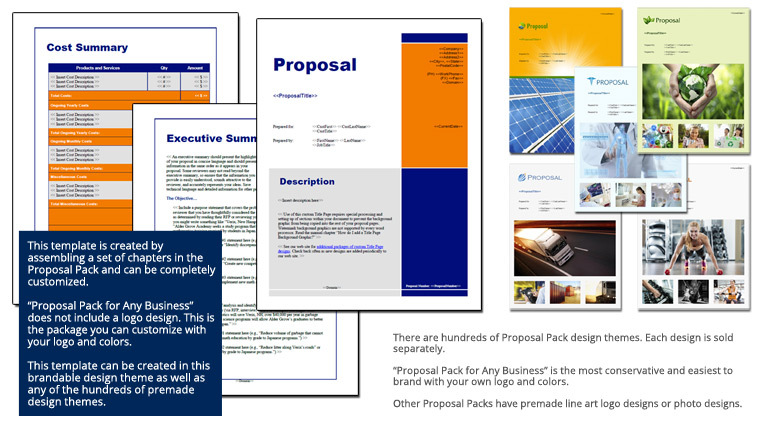 The Proposal Pack design theme you purchase will determine what the visual look of this template will be. The screenshot above only shows the plain generic design theme. A wide variety of chapters are included and are intended to be assembled based on your needs. All proposals are different and have different needs and goals. Proposal Pack is designed so you can customize the documents to suit your needs. This document is best created using the Proposal Pack Wizard - Expert Edition software to select this template and build it in the Proposal Pack logo design theme of your choice along with any desired customizations (such as adding additional chapters, removing unneeded chapters, changing the order of chapters, importing your company logo, etc.). This template is an outline for a proposal that can be used for the described situation. It is each individual users responsibility to type in the actual content of the provided pages with their own information to complete the proposal. This template is created using Proposal Pack either manually by assembling the chapters or automatically by using the Wizard software. The Expert Edition of the software is included in the Proposal Kit Professional bundle. Ian Lauder has been helping businesses write their proposals and contracts for two decades. Ian is the Owner and Founder of Proposal Kit, one of the original sources of business proposal and contract software products started in 1997. Published by Proposal Kit, Inc.